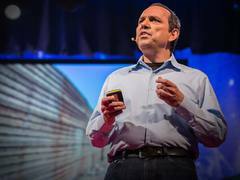 Teddy Cruz: How architectural innovations migrate across borders In today’s talk, Teddy Cruz looks at San Diego-Tijuana border, where some of the wealthiest neighborhoods in the United States are just a short drive from some of the poorest communities in Mexico. As used materials flow from San Diego to Tijuana, transforming the kinds of structures created there, people move from Tijuana to San Diego, retrofitting neighborhoods to accommodate their needs. Cruz is fascinated by how what was once a single family home can become a dwelling for an extended family, a home base for a small business, even a place of worship for many. He is deeply inspired by this multi-dimensional use of space. We were curious: how does Cruz design buildings with these big ideas in mind? Below, a look at some of his studio’s projects, along with Cruz’s notes on what you are seeing. One of the most important issues underlying our research at Estudio Teddy Cruz is producing new conceptions and interpretations of the informal. Our research at the San Diego-Tijuana border has focused on the informal, not as an aesthetic category but as ‘praxis,’ a set of functional urban operations that allow the transgression of imposed political boundaries and top-down economic models. The informal is the site from which to produce new interpretations of infrastructure, property and citizenship. On the Tijuana side of the border, we have been exploring how this city’s informal communities grow faster than the urban cores they surround, creating a different set of rules for development, and blurring the distinctions between the urban, suburban and the rural. We have been working within informal, favela-like settlements in Mexico, enabling a process that engaged the conflict between emergency housing, labor and ‘maquiladora’ factories in Tijuana. We have observed that as NAFTA maquiladoras position themselves strategically adjacent to Tijuana’s slums in order to have access to cheap labor, they do not give anything in return to these fragile communities. Our site of intervention is the factory itself, utilizing its own systems and material production and prefabrication in order to produce surplus micro-infrastructure for housing. We are currently producing a maquiladora-made prefabricated frame that can act as a hinge mechanism to mediate across the multiplicity of recycled materials and systems brought from San Diego and re-assembled in Tijuana. This small piece is also the first step in the construction of a larger, interwoven and open-ended scaffold that helps strengthen an otherwise precarious terrain, without compromising the improvisational dynamics of these self-made environments. Conditions of social emergency call for the re-organization of resources and the triangulation of prefabrication, government subsidies and social organization. On the San Diego side, our practice has engaged the political and social dimension of housing and density as tools for social integration in the city, while engaging the crisis of affordability nationwide. Community-based NGO agencies like Casa Familiar, in the border neighborhood of San Ysidro, are an example of the social service organizations that have been engaging and managing the shifting cultural demographics caused by immigration within the first ring of suburbanization in San Diego. It has evolved from a social service provider into alternative developer of affordable housing. We have designed a ‘micro-policy’ with Casa Familiar that can act as an informal land use and economic framework for development for the neighborhood, and empower San Ysidro to become developer of its own housing stock. This involves transforming the NGO into an informal city hall to facilitate construction permits and alternative mixed uses and densities and to be a facilitator of micro loans by managing the brake-up of large construction loans and subsidies. In a village outside Managua, Nicaragua, small water infrastructure becomes the armature for housing. A ‘gutter beam’ acts both as structural system and water collection system to begin the evolutionary process towards building housing in rural Nicaragua. Tijuana recycles the leftover buildings of San Diego, recombining them into fresh scenarios, creating countless new opportunities open to the unpredictability of time and programmatic contingency. InfoSite, the nomadic information center for inSITE05, a major trans-border art event, was the excuse to engage these tactics of recycling across the border by transferring a San Diego house into the informal urbanism of Tijuana. InfoSite served as the ephemeral site for a wooden armature that, by the end of the event, was exported to Tijuana. Once in the neighborhood, the house’s frame was absorbed and altered by its residents. We wanted to insert InfoSite into the existing flows of pedestrian traffic at downtown San Diego’s Balboa Park, while transforming an existing parking lot in front of the San Diego Museum of Art into a ‘portable’ public space. It wasn’t just the relationship of the ephemeral information center to the network of existing museums in the Park that was of importance here, but also the temporary infusing of this underutilized space with alternative art and culture programming. InfoSite aimed to create an alternative zoning category for the many parking lots that fragment the city, becoming an instrument to carve a different kind of public experience. It was a platform for the exchange and dissemination of information within the increasing privatization and homogeneity of the public realm. Ultimately, the juxtaposition of the house and its different uses on the fabric of downtown was a critique of the rigidity of current zoning practices in San Diego. This small piece became a site of critical information, not only about the inSITE05’s intervention in the context of the trans-border urbanisms it occupied, but also as a way to reflect on San Diego’s politics of development and land use. The site for the house was composed of ready-made infrastructures. It consisted of a variety of off-the-shelf systems and materials like truck beds, pallet racks, tents and traffic cones. These were assembled into a variety of configurations, creating diverse environments to accommodate the programmatic needs of inSITE05. “Political Equator Meetings” are nomadic urban actions that move across diverse sites between Tijuana and San Diego. These meetings unfold around a series of public works and performances, and include walks that traverse these conflicting territories and serve as platforms to re-contextualize debates and conversations among diverse publics. These conversations on the move enable the audience to be both witness and participant. The “Political Equator 3: Border-Drain-Crossing” took place in June of 2011. This time, the audience moved between two marginal neighborhoods on either side of the San Diego-Tijuana border fence. These communities, which flank the checkpoint and are adjacent to Tijuana River Estuary (a US protected estuary that is now layered with militarization), were represented by their local community-based NGOs: Casa Familiar on the US side, and Alter Terra in Laureles Canyon in Mexico. The most emblematic public action during PE3 was an unprecedented public border crossing through a drain, built by Homeland Security — a byproduct of the construction of a new highway of surveillance that runs parallel to the border wall. The audience slipped from San Diego to Tijuana, into a slum home to approximately 85,000 people. This public action sought to encroach on the official institutional protocols, requesting the designation of this specific drain as a temporary — but official — port of entry. This crossing resulted from long discussions and negotiations with both Homeland Security and Mexican Immigration that camouflaged this happening as an artistic performance, while implicitly orchestrating the visualization of the collision between environmental zone, surveillance infrastructure and informal settlement. As the audience moved southbound against the natural flow of wastewater coming from the slum, it reached Mexican Immigration officers who had set up a tent on the south side of the drain inside Mexican territory. The strange juxtaposition of murky water, the stamping of passports and the passage from pristine estuary to slum amplified the contradictions between natural security, environmentalism and the construction of citizenship. As investment in surveillance infrastructure along the US-Mexico border has further marginalized the communities adjacent to the border fence, while compromising trans-border watershed systems that are essential to bio-regional sustainability, the contradiction is opened: The construction of border walls for the sake of security is only exacerbating insecurity. The Political Equator 3 not only exposed the dramatic collision but also articulated the urgency for strategies of co-existence. The need to re-imagine the border is the foremost challenge for the future of this bi-national region, and of many other border regions across the globe. A community is always in dialogue with its immediate social and ecological environment; this is what defines its political nature. But when this relationship is disrupted and its productive capacity splintered by the very way in which jurisdictional power is instituted, it is necessary to find a means of recuperating its agency.